Join and support more than two hundred computer programmers as the American Digital Diversity Initiative will host a HACKATHON on the weekend of February 8 - 10, 2019 at California State University Long Beach. All registered hackers will be competing for multiple prizes as they create solutions to help in the development of growth within our cities and the future of work. EVENT Registered teams can complete coding challenges for a top prize of $3,000, $1,500 2nd prize and $500 for the 3rd prize winning team. Top collegiant team awared $1,500. 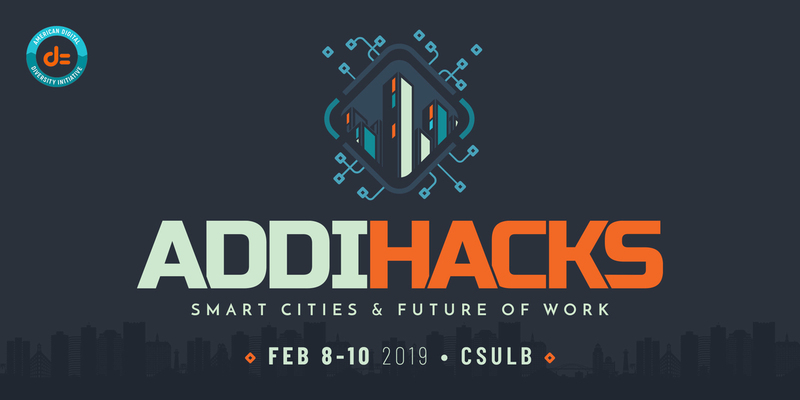 LEARN & GROW ADDI will provide coding classes/workshops during the Hackathon to provide information, guidance and resources for those people interested in pursuing tech careers. BUILD & WIN Hackers compete in teams to win prizes while creating solutions aimed at providing strong community support and improving the quality of life for others. Must have college ID to qualify for the collegiate prize.